The sun is in Cancer from June 21st - July 22nd. If your sun sign is not Cancer, these stones are still useful. The zodiac energy of each sign surrounds all of us based on the time of the year. The energies of Cancer are at work now. More than any other sign, Cancer energy is a series of contradictions. At first it feels gentle, kind, sympathetic, and patient. Then with a click of a crab claw it turns cranky, snappish, and selfish. During this time of year, you may feel the need wallow in self-pity and complain endlessly about how mistreated you are by the world. Turn another page of the calendar and suddenly you are back being helpful, solicitous, ready to do anything asked of you. You'll want to act cautiously and a sense of security and a courageous urge for the next adventure simultaneously. The timing of this energy is also worth note. The middle of the summer is a common time for family reunions and other gatherings of family. Cancer energy is very nurturing and people with the sun sign of cancer are often thought of as motherly. Abalone Shell connects the Cancer energy back to the ocean, back to water. It can aid in communication, especially when you are feeling especially indecisive or contradictory. It also brings peace and beauty into your life. Agatized Coral is another stone that connects the user to the water of the ocean. It offers support, healing and strength for the motherly, nurturing Cancer. Cancers feel emotions more strongly than the other signs, so this time of year you may find your emotions are on the edge. Calcite can help you express them in a positive manner without overreactions. Carnelian can bring some balance and grounding to the water bound Cancer energy. It also encourages a creative outlet for all the emotions bouncing around inside of you during the Cancer season. Moonstone pulls the nurturing moon energy and vibrant water energy to the ground. It can also help develop and inspire your psychic intuition. Opal removes fear during the times you are doubting yourself and encourages personal power when you are feeling confident. It is another stone that enhances your intuition. Like Carnelian, Rainbow Obsidian can help balance you and bring the energy down to earth. It also has a mystical quality that many Cancers are drawn to. Rose Quartz enhances love of all types. Cancer energy is very nurturing and caring. This stone can channel and amplify the compassion you may be feeling, especially for yourself. Ruby is perfect for using with Cancer energy because it is both grounding and nurturing. It ignites love and passion and can help the user feel a sense of abundance. Chalcedony brings a sense of familiar connection, which is perfect for the nurturing motherly energy of Cancer. It is another stone that can help balance and stabilize the Cancer energy. Selenite is named for Selena, the moon goddess because it helps with psychic abilities and making a connection to moon. If you are especially prone to overreaction and moodiness, red or peach selenite may be better options. Want my list of Cancer crystals? Click the button below to request your list to be sent to your inbox. 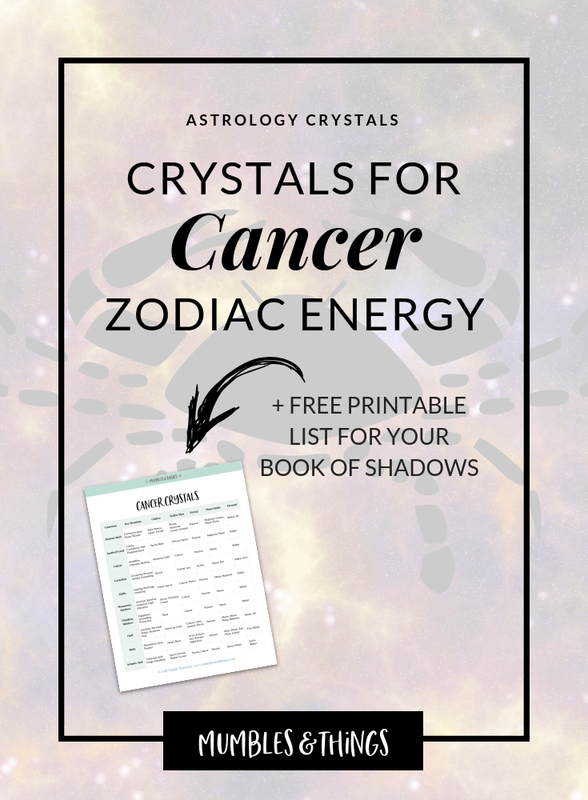 This list includes the top 10 crystals associated with the zodiac sign Cancer, plus, the three key uses, primary chakras, polar energy, planetary ruler and element correspondence.